If the skin on the shoes cracked, lost its Shine, and it has been scratched, do not have to wait in the far corner. There are many ways to "revive" the leather surface, which will help the shoes to last more than one season. The skin on the shoes longer retain marketability, take care of it after each wear. To do this, take a sponge or soft cloth soaked in clean water and wring well so she was barely wet. She wipe the leather surface of the Shoe. After that, dry the boots away from hot radiators and any other heat sources. At any specialty Shoe store sells the means to care for shoes. They come in different consistency, including in the form of a spray. All you need is to spray it a few times on the leather surface and Polish it with a soft cloth or velvet. These funds will help to cope with strong dirt, returning the shoes look. If leather shoes began to lose their Shine recently, regularly (at least 2 times a week) treat their surface water-repellent cream, the main purpose of which is to soften and prevent cracking. Give preference to European brands, which are more expensive than any other, but care more efficient. Cream should be applied only on dry boots. To restore the color of leather shoes will help coloring tools, which can also be found in Shoe stores. 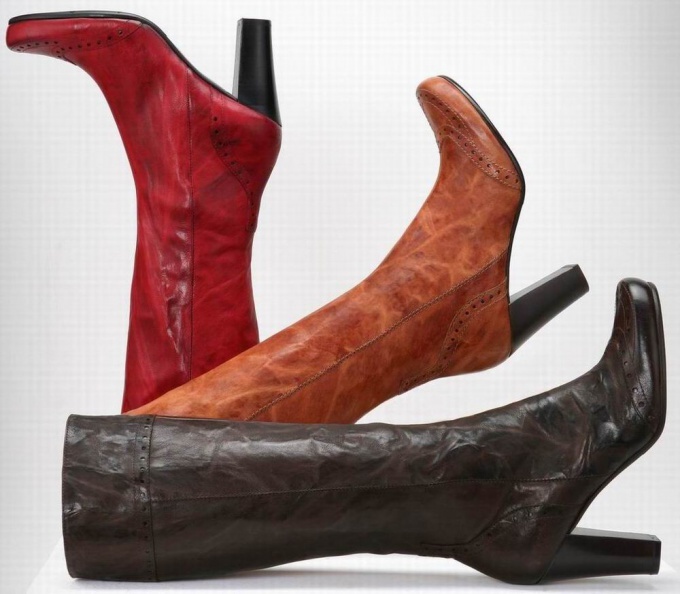 With their help you update your aged shoes or boots, "refreshing" the main color or giving them a different hue. Pigments will mask the scratches and if the tool is really high quality, will protect the shoes from cracking. Before use, do not forget to read detailed instruction. How to eliminate spots that can appear on shoes in the socks? Cut the onion in half and RUB her soiled areas or use onion juice soaked cotton swab. If the shoes start to fade, the regular application of glycerine or vaseline will help to restore the skin's surface. In addition, using glycerin to remove traces of mold that have emerged from the damp. None of the methods did not produce the expected results? Contact companies that offer professional restoration of leather on shoes. This method will probably be the most effective, but only if the bad shoes you intend to wear more than one season, as this service will require certain financial costs. 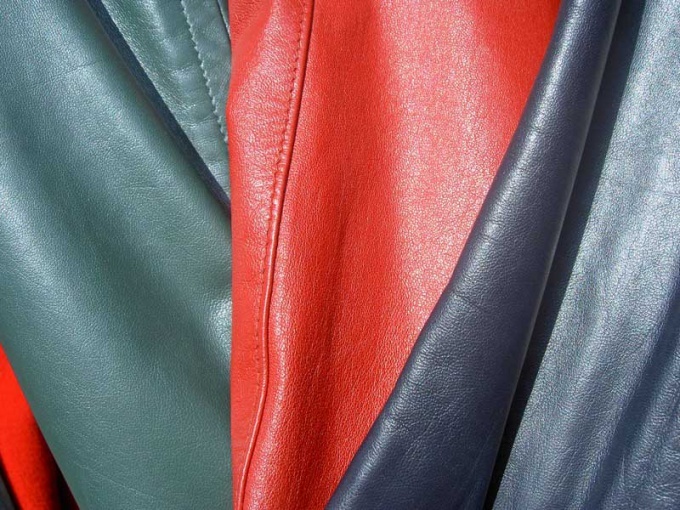 Leather clothing and shoes: convenient, practical and easy to care for. It is not necessary to wash and wash, just sporadic, light, surface treatment. But sometimes under the influence of water skin soubelet. Not to throw a thing, you can try the skin softening. In principle, leather is not afraid of water. Usually it is impregnated with special water repellent. Accidentally getting into a leather jacket in the rain does not threaten neither the jacket nor its owner. But if the water managed to reach the inner surface of the skin, and this can occur as a result of falling in a puddle or getting wet through the shoes, after drying, the skin hardens, the thing becomes unfit for consumption. But hurry and throw it is not worth it. You can certainly give something to the dry cleaners with a request to soften the skin. But this is not always possible. It is best to try to solve the problem yourself. On the Internet you can find tips on softening the skin with glycerin or sunflower oil. But it is better not to follow them. Sunflower oil gives the appearance of softening, then the skin will freeze even more, besides it will acquire an unpleasant shiny look. Well glycerin will soften the skin, but will make her very fragile. Very good, effective and inexpensive means to soften the skin can serve as castor oil which can be easily purchased at any pharmacy. Saturate a cotton swab with castor oil and blot well with it the surface of the jacket or boots. Give the oil an hour for soaking, repeat the process. Skin will become soft and elastic. If the oil can't get, looking for a good Shoe cream, which includes wax. You can take the cream, color coordinated to the skin, but it is better to stay on the colorless. The pharmacy will still have to go. Ask them to give you a good cream. Mix the two ingredients in a ratio of 1:1, densely cover leather product obtained by the composition. Not only will you soften the thing, but and update its color. Leather gloves can be softened using the hand cream. Put on gloves, apply the cream and massage well hands until absorbed. In Shoe stores you can find a variety of means on care of footwear, each of which is designed strictly for a particular material (natural or artificial leather, nubuck, suede, patent). It is a cream, wax, aerosols, special sponges and brushes. If you want to keep your shoes always in good form, it is necessary to use these special funds, as well as guided by certain rules. Any shoes dry naturally, never put it near batteries and do not use the dryer. Otherwise, leather can harden or crack. Very wet shoes dry with the newspaper inside and put often change, newsprint is very absorbent. Oil cream shoes only after drying. Patent leather shoes can be cleaned with a brush. To clean it of dirt, use a damp sponge or soft cloth. To return to the original lacquer boots, periodically apply with a sponge or swab on the surface of the Shoe glycerin or petroleum jelly, leave on for 10-15 minutes, then wipe off the excess. If your shoes have stains, you can display them by rubbing with a cut onion or a swab moistened with petrol. Before this procedure, make sure in an inconspicuous area that the bow itself or the gasoline does not leave unwanted spots. Shiny spots on suede shoes should be cleaned with a special rubber brush. If you don't have one, you can use a normal eraser. If the suede is very dirty, you can clean it with a brush dipped in a solution of warm soapy water with ammonia (1 tablespoon alcohol to 5 tablespoons of water), then washed with cold acidified water (1 teaspoon of vinegar per liter of water). Then hold the shoes over the steam to restore the texture of suede. The genuine leather shoes can not be cleaned with gasoline or acetone. Strong pollution delete the first dry cloth, then wet. White shoes can be washed with a weak solution of washing powder. Shoes made of artificial leather should be treated in the manner specified by the manufacturer. Usually artificial and synthetic leather wipe with a sponge or cloth, sports shoes are allowed to be washed in cold water. Colorless sprays and creams for versatile shoes of any color, but using color tools, you can make invisible small scratches and cracked places. Almost everyone at least once to buy leather shoes. But some face an unexpected problem: the backs on too tight, the socks are too hard. But the model is very fancy, and want to buy it. 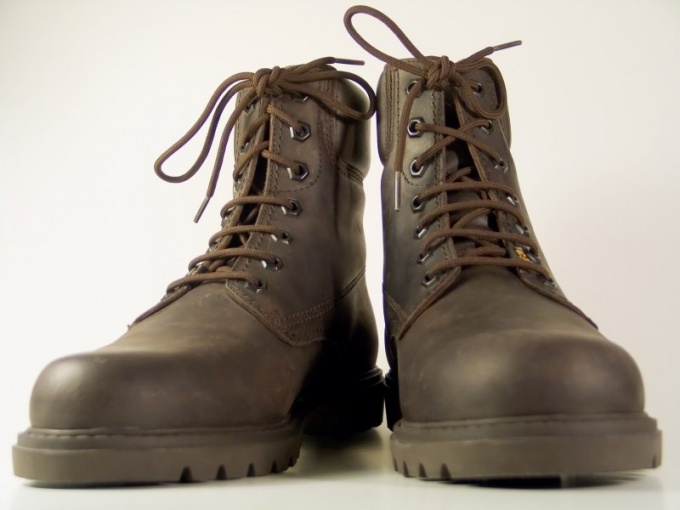 In addition, some footwear articles of leather tend to become more stringent over time. Are there ways to soften the shoes, to make it more comfortable and wearable? To soften leather shoes have special patented lotions, sprays, and waxes from well-known manufacturers of means on care of footwear. Also, there are folk ways. To soften shoes, massaging it a little glycerine. It should be left for a few minutes. Subsequently, the product must be carefully polished. This method will not only soften your shoes, but also prolong its service life. Castor oil is also a great way to soften footwear. To do this, drip it on a cotton swab and carefully wipe them with leather shoes. Another popular method is linseed oil. They need a few times to wipe the joints, thereby softening the shoes, but note that this product is slightly stretched. If your new shoes "burning" feet, to get rid of this problem will help a three percent solution of vinegar. They need to wipe the product from the inside, and then leave for a few minutes until dry. 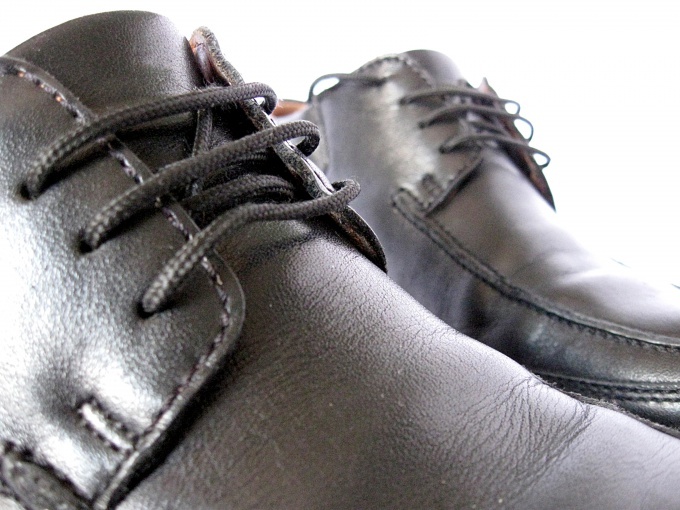 If leather shoes are too wet, its not waiting until it has, should be lubricated with vaseline, and only a few hours, you can use the cream to clean and then Polish. Winter, spring and autumn shoes can be lubricated "national cream - unsalted lard. In the cold this product has excellent softening effect for footwear products and is also protected from moisture. If it is necessary not only to soften leather shoes, but also to stretch, it should be pre-wet, and then treated with kerosene. After this you need to dry your shoes. A good way to mitigate the hard backs new shoes is rubbing them with paraffin candle. You can prepare a special ointment to soften, melt in a water bath beeswax and add castor oil and turpentine. It will give Shine and softness, and lustre, and become a barrier to moisture.